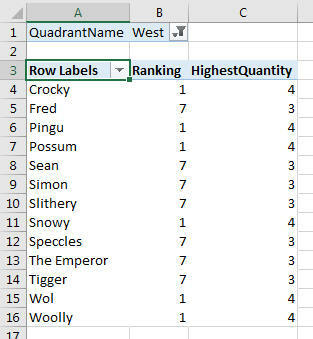 RANK.EQ This function is included to provide compatibility with Excel. It provides a subset of the functionality of RANKX, and is rarely used. 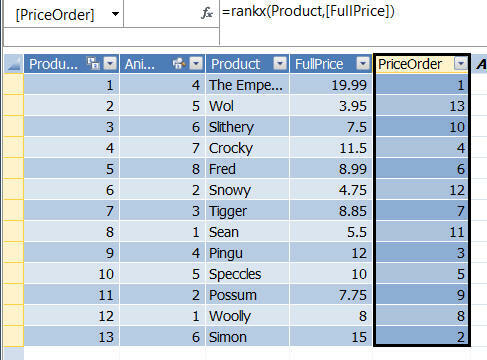 EARLIER This function provides an alternative way of ranking data, and is if anything even harder to understand than RANKX! 1 Table The table you are ranking over. 2 Expression The expression you're ranking by. 3 Value A bizarre chance to do one-off value substitutions (see foot of page). 4 Sort order Whether you're sorting in ascending or descending order. 5 Ties How to handle ties. Arguments 3, 4 and 5 are explained under separate headings further down this page. The Emperor is the most expensive product; Wol the cheapest. Note that the default is to use descending order, which is the opposite of usual Microsoft practice (not to mention common sense). Note the comma as a placeholder for the third argument. Things get a bit more complicated when you create a measure to rank data. To illustrate this, I'll show getting it wrong first. 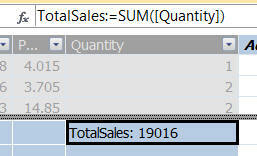 First create a measure called TotalSales, to sum the quantity for transactions. This measure ranks species by total sales. What could possibly go wrong? The rank is 1 for every cell. The reason for this is that a measure will aggregate data for the records in the underlying query context. 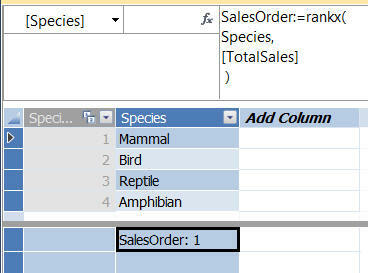 This formula is showing (for example) that the total sales for the East quadrant for the Amphibian species is the first (and only) value in the set of figures for the relevant cell. I've included the total quantity sold to show the results aren't fiddled! Mammals are always the best-sellers, and amphibians always the worst. There are 6 products which share top ranking for this measure (with 4), so the next ranking begins at number 7. The same rankings but using the Dense method of dealing with ties. To complete the picture, the third argument of the RANKX function allows you (bizarrely) to substitute a different value for each cell of a pivot table. The only way to understand this is by example! I'm going to try to explain why in this pivot table the WeirdRank statistic shows 6 for Owl. Any lowest price more than 4 (the biggest HighestQuantiy) ranks as number 1. This use of RANKX blows my mind, to be honest; just as well it's not that useful! And with that, I'm done with ranking!